Of all the wood burning pizza ovens for sale across the UK, this official Forno Buono Outdoor Pizza & Bread Oven is one of our favourites, offering the perfect balance of high-end design and cost-efficiency. Unlike some other traditional wood-fired pizza ovens that let a lot of heat escape, this Amalfi Pro oven has a double-skinned thermal lining that keeps heat effectively trapped inside – meaning the minimum of fuel is required to keep it cooking. If you’re looking for a real al-fresco dining experience, this medium-sized outdoor pizza oven is the ideal piece of authentic cookware for your garden or patio. Thanks to its sturdy frame and easy-glide coasters, you can move it around your outdoor space with relative ease. It’s big enough to cook a decent amount of food, but small enough not to dominate your garden. Owners of an Amalfi Pro Wood-Fired Outdoor Pizza Oven are not confined just to baking pizzas – it can also be used for a range of other foods such as bread, muffins and roasted meat. You will get some great-tasting results with a rib of beef or a leg of lamb. The fuel shelf underneath the oven is the perfect place to store your wood, charcoal and other kindling, keeping everything neat and tidy in one place. 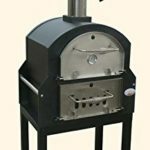 This wood burning pizza oven has a unique look to it that makes it a very popular purchase in the UK. The matte black finish and bevelled roof give it a sleek aesthetic that contrasts rather beautifully with the duotone steel doors. But if it’s not your thing, there are other styles available in the same range, including the Forno Buono Napoli and Forno Buono Sorento. The Napoli can be used for grilling, and the Sorento will even do cakes and desserts. There is more versatility to be had – but you’ll find the prices reflect the additional features. That’s why the Amalfi Pro is considered a good middle-ground option. 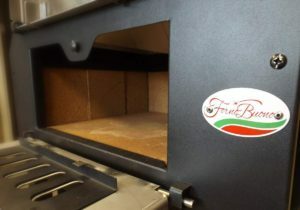 It goes without saying that this quirky wood-fired oven yields truly delicious baked Italian pizzas – courtesy of its genuine Italian manufacturer. Unlike simple clay pizza ovens, this one has a useful thermometer gauge that allows you to check when the oven has reached optimal cooking temperature. This pizza oven will ship throughout the UK to England, Wales and Industrial Scotland, and transport you in an instant to Italy’s southwestern coast. Are Pizza Ovens Just for Summer?